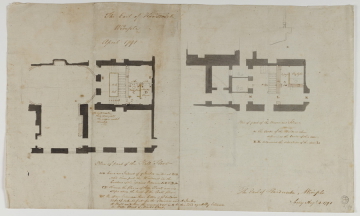 Drawing 9 is a copy of a working drawing sent by post to Mr Provis on 4 August 1791. The original design, however, was made in April 1791. The addition consists of a Portland stone staircase, a maid's closet and two water closets. It occupies most of the west courtyard, with a small lightwell remaining from the ground floor to shed light into the ground floor closets and through a skylight of the basement water closet. Pink wash in drawing 9 indicates the new building work, therefore 'Red' has been inscribed on part of the plan as a correction to the drawing. Yellow indicates timber, which is used in the partitions enclosing the water closets. 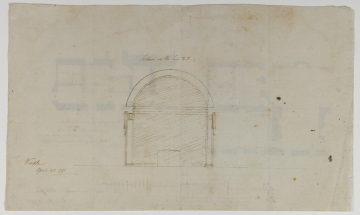 The verso of drawing 9 has a section in Soane's hand made in April 1791 and showing the north arm of the drawing room looking south. Rather than the segmental barrel vault of earlier designs (drawing 6), the vault is on a semicircular arch (as in drawing 7).